Perfect for Suit for home, bedroom, bathroom, office, etc. 【Intelligent design】 The spring has a significant cushioning effect, can bend flexibly and restore its original shape. The rubber head can avoid marks on the wall or door, while the metal base can hold the wall or door with the screws. 【Multi Scene Application】The 3.74inch(95mm) length can prevent doors from opening too far and damaging nearby walls. Suit for home, bedroom, bathroom, office etc. 【EASY INSTALLATION】These door stoppers can be installed into the needed places. 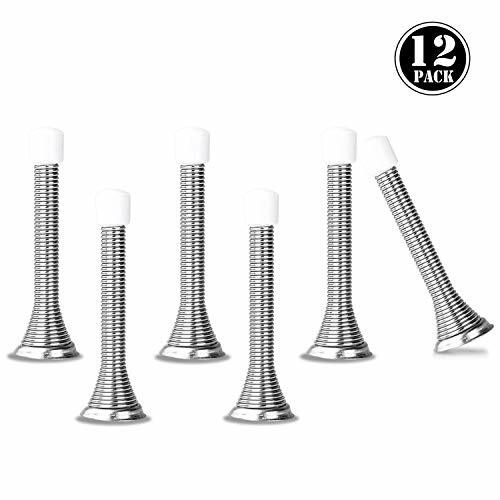 using the included screws, which are conveniently located inside of the base plate of each door stop. Just unscrew the base plate, then you will find your installation screw inside. No special tools required, even you're a greenhand. 【100% MONEY BACK Guarantee for your peace of mind】 If for any reason (or no reason at all) you're not happy with your spring door stop ,we'll either send you a replacement or fully refund your purchase - whichever you choose. Your trust and business is that important to us. If you have any questions about this product by TZAMCW, contact us by completing and submitting the form below. If you are looking for a specif part number, please include it with your message. Zhao Xiemao Child Safety Door Card Anti-Grip Door Security Products High Strength Does Not Break C-Type Door Clamp Door Stop.